The Komodo dragon is probably the closest animal to the dinosaurs still living. 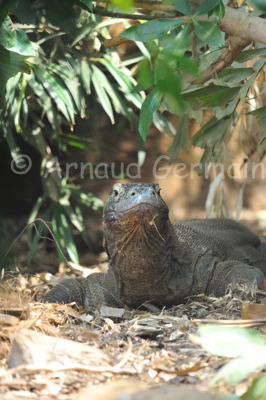 This huge reptile lives in small islands in the Pacific Ocean, but a few specimen are help in captivity. London zoo has a magnificent enclosure for these lizards. I shot through the glass of the enclosure to get this picture. In the wild, they can hunt prey as big as buffalo. They bite, then retreat as the animal slowly dies of septicaemia. The saliva of the dragons is full of bacteria causing blood poisoning. The dragon follows the victim until it dies, then feeds on it. Nikon D700, Sigma 150-500mm OS at 450mm, F6.3, 1/500s, ISO 2500, handheld.